BBC America announced on Thurdsay morning, just days before Killing Eve’s April 8 premiere, that the series has been renewed for a second season. 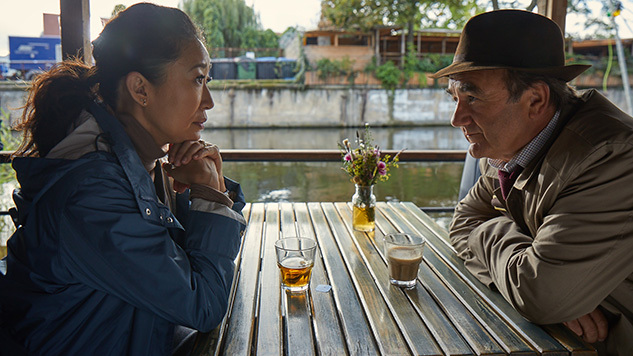 Killing Eve stars Golden Globe winner Sandra Oh as Eve, a bored and lowly MI5 security officer whose desk-bound job doesn’t fulfill her fantasies of being a spy. Jodie Comer, known for her role in STARZ’s The White Princess opposite former Game of Thrones star Michelle Fairley, plays the enigmatic and talented killer Villanelle, who clings to the luxuries her violent job affords her. Based on the novellas by Luke Jennings, the series topples the typical spy-action thriller as these two obsessive women engage in a ruthless game of cat and mouse. Killing Eve also stars Fiona Shaw, whom you’ll recognize as Aunt Petunia from the Harry Potter franchise, along with Kim Bodina, David Haig, Sean Delaney, Owen McDonnell and Kirby Howell-Baptiste. Fleabag creator Phoebe Waller-Bridge serves as showrunner for the new series. This show has the thunder of women on both sides of the chase in Sandra Oh and Jodie Comer and, importantly, behind the camera with the lavishly brilliant Phoebe Waller-Bridge. The early response to Killing Eve has been incredible—for that reason, as well as the fact that we wholeheartedly love this original, funny, thrillingly entertaining series, we are delighted to move ahead with a second season before we even premiere. Killing Eve was renewed by BBC America President and GM Sarah Barnett and Nena Rodrigue, EVP of Original Programming, Acquisitions and Production. Waller-Bridge, Sally Woodward Gentle and Lee Morris will serve as executive producers, with Oh as an associate producer. The series is produced by Sid Gentle Films Ltd and distributed by Endeavor Content. Check out some stills from the series here and catch the critically acclaimed show’s premiere on Sunday, April 8 at 8 p.m. EST.